Please read the blog article Is a hybrid course in wilderness medicine right for you? before registering for this course. After you submit your registration please call the Adventure Leadership Trip Center to pay for your course at (734) 764-3967; your registration is not complete until payment is received. These downloads contain important information to help you prepare for your course. Use the course syllabus as a guideline for making your travel and study plans; note that topics and times may change subject to local weather conditions. Remember you must be present and engaged for the entire course or practical session to be eligible for certification. Be prepared. Thoroughly read the student handbook as it provides detailed information about expectations—yours and ours—what to bring, wear, and how to study. Please contact our office with any questions. 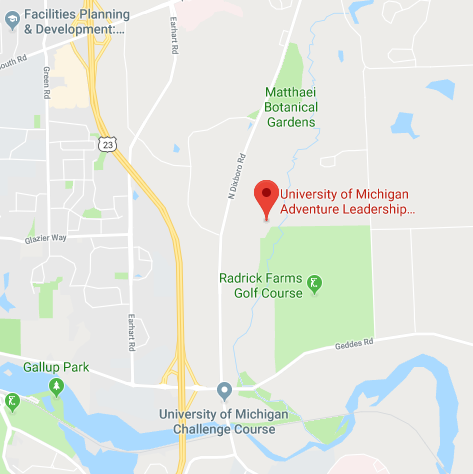 The practical session for this hybrid course is held at the University's Adventure Education Center, a 150-acre site located near Ann Arbor. The center's challenge course set amidst woods and streams adds a unique element to hands-on simulations, all within easy reach of the classroom in the facility's main building. Camping: $15/night onsite. Please contact Katherine Martin for details. Meals: Bring lunch and snacks with you; there is not enough time to drive to town during the daily lunch break.